Far be it from me to tell you exactly which pair will be your best hiking boots. Your feet and my feet are not alike - what works for me may pinch the heck out of your feet. So let me share with you a pair that I feel at the most comfortable hiking boots around. I'm partial to these lightweight but rugged KEEN boots right now, although I hiked for decades in heavy soled boots. But I know how to buy hiking boots, having purchased and worn out so many of them over the years. Finding the best womens wide width hiking boots is my specialty, being blessed with wide feet plus a high arch. KEEN is a great brand for feet like mine. Recently, this hiking boot brand has ventured into offering choices for those with narrow feet as well. Waterproof hiking boots are an absolute necessity in certain climates and seasons. You need to approach boot buying in a particular manner, outlined here. And if you're vegan, you'll need to investigate whether the manufacturer used vegan hiking boots components - an extra bit of detective work. 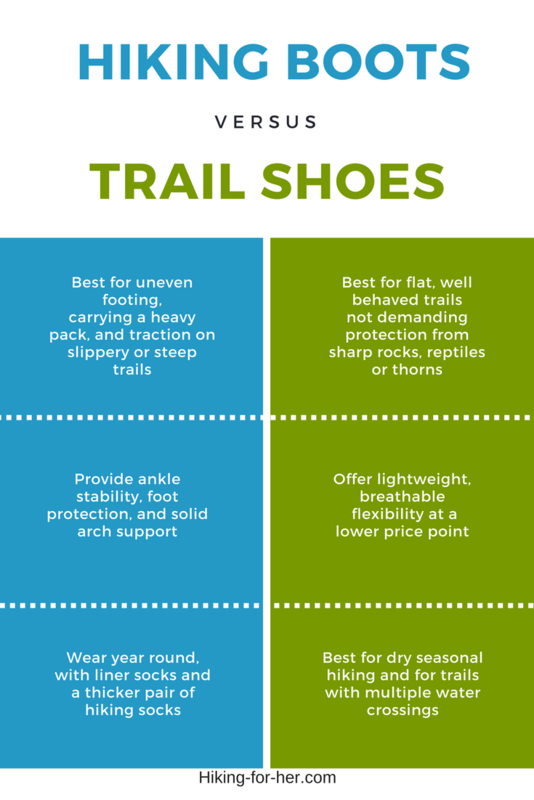 If you're going to be doing lots of backpacking over rough terrain (roots, rocks, mud, and more) don't skimp on your footwear! Look for the best lightweight hiking boots you can find, and dial up from there to make sure they're rugged enough for your hiking plans. 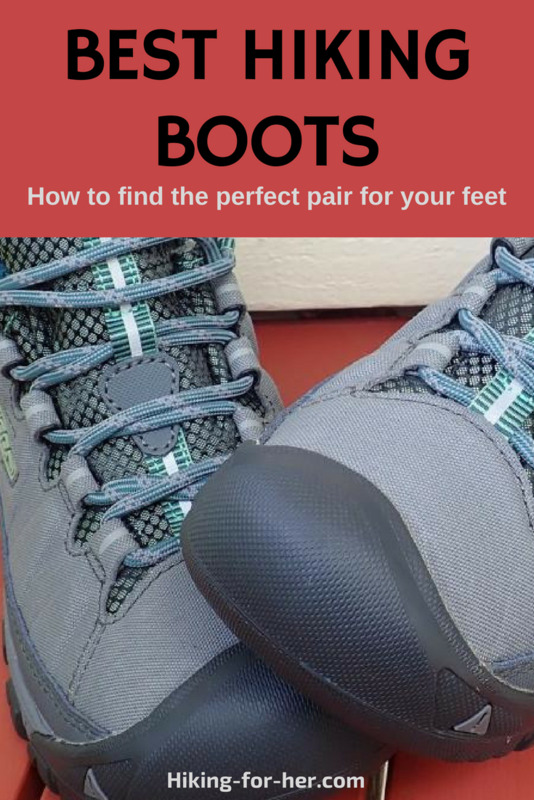 Instead of lecturing you on the "right" hiking boots, let me line up a few boot features for you to ponder as you consider purchasing a pair of your best hiking boots. but the sturdy soled kind with enough support and tread to endure those rocks, roots, stream crossings, mud and even a bit of snow. (Hint: wearing hiking gaiters helps!). A quick tour of your boots is in order. Feel free to skip it, but knowing the anatomy of a hiking boot makes you a well informed boot buyer. If you are planning on using the boots for flat trail hiking you don't need to be concerned about "grippy" soles. But if your hikes take you to uneven terrain (a very real possibility for any hiker), you want gripping ability. Be sure to turn over the boot and check out the depth of tread on the sole. Another consideration you might not think about at the time of purchase: are the soles replaceable? I tend to wear out the tread long before the uppers are trashed, and want the option of replacing the soles. Rubber soles made out of Vibram have lasted a long time on my hiking boots. On the other hand, replacing the soles might cost more than the original purchase price! Will these boots stand up to what you are going to throw at them? Here's where it pays to go to a store with trained sales people. They can answer your questions, show you literature from the manufacturer, and hopefully share their own experiences with selecting best hiking boots for all sorts of feet. I don't know about you, but I wouldn't buy a car from someone who doesn't drive. Why buy hiking boots from someone who doesn't hike? Some boots have removable inserts - a great plus when you need to dry them out after fording a river. These inserts will conform to the contours of your feet, and need to be replaced every so often in order to maintain a good fit. Another use of the word "insert" may refer to needing to buy an additional insert for a perfect fit. The boot store will likely carry these inserts, and can guide you as to what you need. Or you can try Dr. Scholl's or some other name brand, from the nearest drugstore or pharmacy (less expensive, can be cut to fit, wear out after one season, but may just do the trick). Be sure you can easily replace your boot laces once you remove a broken/frayed lace. One pair of my boots requires a pliers and lots of patience to re-lace after I apply waterproofing - yuck! It definitely demotes the boots down my "best hiking boots" list! And always carry a spare set of laces in your pack (don't ask me how I learned that!). Note: Some boots have "lacing systems", making it hard to repair or replace a broken lace. 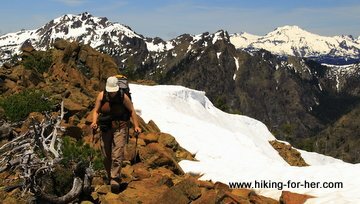 on the best hiking boots? 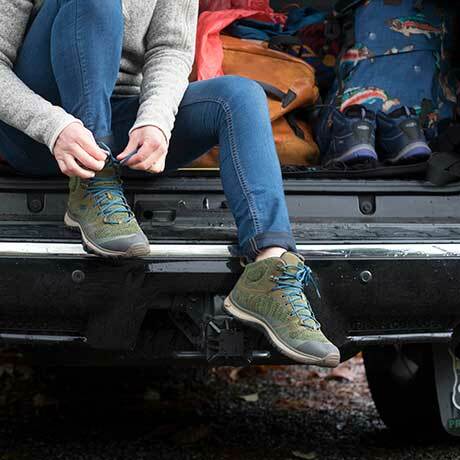 For the fine grained details, read this Ultimate Guide to picking the best hiking boots for your feet. Or click the photo to go to KEEN's details. Are there best hiking boots "accessories"? Many hikers make the rookie mistake of leaving on a quest for best hiking boots wearing just any old socks they happen to find on the top of the muddled sock drawer. A reputable boot store will have various hiking socks for you to wear as you try on the boots. But why leave it to chance? Nowadays you can buy liners and hiking socks from many manufacturers. Find some hard earned sock wisdom here. They may be causing your foot to slide around and create friction/heat in your boot. Another idea: put duct tape on the hot spots BEFORE they get too hot. *Shop when your feet are at their maximum size, at the end of a long day. *Width and length varies a LOT by manufacturer. Your "normal" shoe size won't be the right fit. Don't be embarrassed if you need a size (or 2) larger - it's only a number! You want high performing feet, right? Again, here's where it pays to go to a reputable boot dealer with knowledgeable staff who will take the time to work with you on a good fit. *Bring your own socks - see above, and orthotics, if you require them. *Walk around for at least 15 minutes in the boots, trying to simulate up and downhill walking (tippy toes, heel walking). Better yet, actually walk on stairs, if the sales folks are amenable. Some stores (REI Co-op, for instance) have built-in stairs and uneven terrain for testing your boots right there in the boot department. You can also go to the backpack department, borrow a loaded backpack, and walk around the store for awhile. *Be sure you can return/exchange the boots within a reasonable amount of time if they don't work out for you on the trail. *Consider renting boots if you are a complete newcomer to hiking boots. This gives you a chance to try out various brands, without making an expensive commitment. *Once you locate the magic combination of manufacturer, size, and style, BUY TWO PAIRS! Then alternate them between hikes. This may seem extravagant, but you've gotta believe me when I say it's tough to find ideal hiking boots! Once you purchase and use your boots, you'll want these tips on how to weather proof and care for them: check this out. ...that trail shoes are the way to go. Now you know a few secrets for boot shopping. And you have some ideas for the best lightweight hiking boots, and how to buy a pair. Have I convinced you that BOOTS are fundamentally important to a successful hike? And that a high quality pair of the best hiking socks are part of the equation?